Patrick Henry (SSBN-599) was laid down by the Electric Boat Division, General Dynamics Corp., Groton, Conn. 27 May 1958; launched 22 September 1959; sponsored by Mrs. Leslie C. Arends; and commissioned 9 April 1960, Comdr. Harold E. Shear (blue crew) and Comdr. Robert L. J. Long (gold crew) in command. Manned alternately by two crews, blue and gold, to maximize her submerged operation, Patrick Henry underwent shakedown with the blue crew until 16 September, when the gold crew took over. 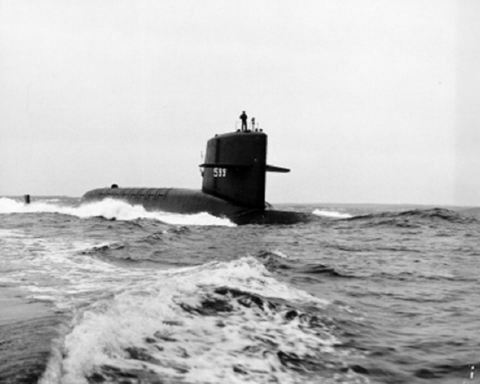 This second Fleet Ballistic Missile Submarine commenced her first deterrent patrol in December 1960, still manned by the gold crew. Between December 1960 and December 1964, Patrick Henry conducted 17 deterrent patrols while remaining continuously deployed overseas, operating out of Holy Loch, Scotland. When she surfaced at Holy Loch 8 March 1961 she had set a record for her type, cruising submerged 66 days and 22 hours. In December 1964, Patrick Henry returned to Electric Boat Division of General Dynamics, Groton, Conn., where she remained for 18 months to complete extensive overhaul and repair operations, including refueling of the reactor plant and modifications to permit the handling of the Polaris A-3 missiles. After shakedown in mid-1966 off Puerto Rico and Cape Kennedy, Fla., Patrick Henry departed Charleston in December for patrol No. 18, equipped with A-3 Polaris missiles and assigned to Submarine Squadron 14. On 1 March 1968 Patrick Henry completed her 22nd patrol at Holy Loch. She remains with the Atlantic Fleet into 1970.